poisonous as they contain cyanide and two forms of allergies are seen to various proteins found in the fruit. 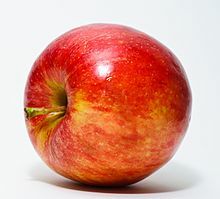 The apple forms a tree that is small and deciduous, reaching 3 to 12 metres (9.8 to 39 ft) tall, with a broad, often densely twiggy crown. The leaves are alternately arranged simple ovals 5 to 12 cm long and 3–6 centimetres (1.2–2.4 in) broad on a 2 to 5 centimetres (0.79 to 2.0 in) petiole with an acute tip, serrated margin and a slightly downy underside. Blossoms are produced in spring simultaneously with the budding of the leaves. The flowers are white with a pink tinge that gradually fades, five petaled, and 2.5 to 3.5 centimetres (0.98 to 1.4 in) in diameter. The fruit matures in autumn, and is typically 5 to 9 centimetres (2.0 to 3.5 in) in diameter. The center of the fruit contains five carpels arranged in a five-point star, each carpel containing one to three seeds, called pips. The original wild ancestors of Malus domestica was Malus sieversii, found growing wild in the mountains of Central Asia in southern Kazakhstan, Kyrgyzstan, Tajikistan, and Xinjiang, China. Cultivation of the species, most likely beginning on the forested flanks of the Tian Shan mountains, has progressed over a long period of time and permitted secondary introgression of genes from other species into the open-pollinated seeds, including such a large amount of gene exchange with Malus sylvestris, the crabapple, that current populations of apples are more related to those of crabapples than to the more morphologically similar progenitor Malus sieversii, though in pure strains without recent admixture the contribution of the latter predominates.